Surrounded by water and filled with warmth, this island is one of the most popular vacation spots on the Outer Banks because of its people. The easiest conversation I’ve ever had about food was with a 91-year-old woman from Ocracoke who still lives in the same house she grew up in. Her name is Blanche Howard Jolliff, and despite our 60-year age difference, we have a lot in common. “Do you like corn flakes?” she asked me. “Well, yes, I do,” I told her. We carried on like this for awhile. Each food she asked about, I liked. Each time I said I liked something, she got more excited and asked again. By the time I left her green-shuttered home on Howard Street, we had established that we both love the water, we both hate getting our pictures taken, we both enjoy all kinds of food, and we both like meeting nice, new people like each other. We spent several hours together, building an easy afternoon out of the things that connected us while sitting in her home on an island that’s disconnected from everything. Jolliff is, as the natives are called, an Ocracoker. That means she lives on Ocracoke Island, a small, 14-mile-long piece of land that’s surrounded by the sea, a place separated from the rest of the world and held together by camaraderie. Its lure is its remoteness. Its heart is its friendliness. Ocracokers, numbering about 900, are an interesting class of people who intentionally choose to live here. And believe them, it does require effort to live full-time in paradise. There are hurricanes, for one. But more, the main industry is tourism, and that means money is tight for everyone in the winter. But they stay because they love the place, and they love their neighbors. Jolliff is an Ocracoker because it’s her home. Others marry into the Ocracoker family. Some have just visited, fallen for the place, moved here, and been anointed Ocracokers. Whatever their reason, being an Ocracoker means being a part of a community in which people are required to contribute more than they take. Ocracoke breathes because the people who live here — and, by association, the people who visit here — understand that it takes kindness to keep their tiny, fragile island from falling off the map. Martha Garrish sells pieces of Ocracoke to people who love it. She’s a real estate broker and former owner of Ocracoke Island Realty. 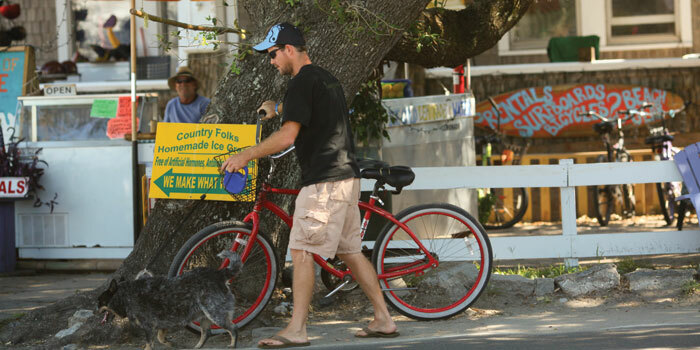 As is the case in most beach communities, real estate could be a touchy subject on Ocracoke, as people try to balance preserving the look of the land while also selling property. But Garrish says there’s not a dishonest real estate agent on Ocracoke. Garrish gives Ocracoke its beauty, simply by not destroying it. The public beach on the ocean side of Ocracoke Island is consistently ranked among the most beautiful beaches in the country. It is a United States National Park, so it is all natural, free of any scenery-jamming high-rise hotels. And in the village, which sits on the Pamlico Sound side of the island, no new building can be taller than 35 feet, keeping the famous lighthouse — 75 feet tall — towering above everything just like it did when it was built in 1823. In the middle of the village is Silver Lake, a man-made lake that connects with the Sound and serves as the waterfront access for the ferries. It is also the place for residential and commercial docks for boats. One of those docks belongs to The Castle at Silver Lake, the former home of local legend Sam Jones, who regularly held parties that brought the island people together. Jones is buried on Ocracoke with his horse. His home became an 11-bedroom bed and breakfast, which, even under new ownership, still embodies the hospitality of its former owner and the island. For all it gives, Ocracoke doesn’t ask for much. Situated at the base of the Outer Banks — a 40-minute ferry ride to the north will put you on Hatteras Island, and a three-hour ferry ride to the south will put you on Cedar Island — Ocracoke is an island that, throughout history, has just wanted to be. It happened to be the place where Blackbeard, the mythical pirate, died in a battle with an army led by British Lt. Robert Maynard at Ocracoke Inlet in 1718. Ocracoke was, in fact, a noted pirate hangout for most of the early 1700s, according to the book Ocracokers, by Alton Ballance. The first true European settlers came a little later, around 1730, when the state decided it needed to hire pilots to live here to help a growing number of ships navigate through the shallow Ocracoke Inlet and into the Pamlico Sound so they could reach the mainland. So, as is still true today, the first Ocracoke residents welcomed people and showed them around. Jolliff’s great-great-great-great-grandfather was one of the first people here. William Howard came in 1759, and the Howard family has been in place in Ocracoke ever since. It is a family that, like the Ballances and the Garrishes and several other native names, has given Ocracoke its backbone. In a plot of land adjacent to Jolliff’s home, a 103-year-old structure surrounded by the sight of live oaks and the sound of cicadas, is the Howard family cemetery. The ground around the graves is covered in oyster shells. Jolliff was one of four daughters who lived in the home. She worked in the post office and was living with her parents when, in 1956, the state decided to build a paved road — N.C. Highway 12 — on the island. That’s when Jolliff met her husband, a worker with the North Carolina Department of Transportation. They married in 1957, and she moved off the island for 25 years but came back in 1981 when her parents died. She’s lived in the home ever since. Her husband died 10 years ago. Jolliff, who still hops on the roof to clean the gutters and rakes the yard and sweeps her porch, remembers when fishermen were the primary breadwinners on the island. She remembers when wealthy men would come here to the hunt lodge, where her father worked, before the Depression. She remembers, of course, the food — baked geese on Sundays and duck on Tuesdays. For all the love Ocracokers give their home, it is not a place for everyone. It seeks quiet and peace more than energy and entertainment. There are no go-kart tracks or amusement parks, no boardwalk or line of beachfront motels. It is a place for people who can be alone, but also participatory. On any given night at the Deepwater Theater, Marcy Brenner and Lou Castro are likely to be found playing music. They are a married couple, and they play any number of instruments as part of their own duo, Coyote, and also as part of the famous local band Molasses Creek. But they are more than entertainers. They are new Ocracokers, and they give Ocracoke its voice. Brenner and Castro speak thoughtfully and softly, and they play songs the same way. In 1997, Brenner discovered she had breast cancer. She was living in California at the time, married to William Randolph Hearst II. But when she needed cancer treatment, she came across the country to Kitty Hawk, where her mother lived and had received care. For three years, Brenner battled the disease. Meanwhile, she divorced Hearst. In 2000, her cancer was in remission when she met Castro, who was living in Duck. She told him she didn’t know whether they should start a relationship because she didn’t know how long she would live. They moved to Ocracoke in 2001. Before that, Brenner had always played an instrument but had never sung in front of an audience. But with Castro pushing her, and Ocracoke welcoming her, she has become one of the most familiar voices on the island. In 2007, Brenner and Castro adopted a daughter and named her Charlotte. But two years later, in March 2010, Charlotte died of a chromosomal malformation. Within hours, 50 people were at their home, cooking food and helping them. Charlotte’s funeral was held at the local Methodist church. The church seats 300. The seats were full, and 200 others stood outside. More than half the island showed up to support the family that had moved here less than a decade earlier. “There’s a reason she came here to this island and this village,” Castro says, tears filling his eyes. Doug and Judy Eifer raised a son for 18 years in Kentucky. Doug was an aspiring chef, and Judy taught gifted education. When their son graduated, they decided to move to their favorite vacation spot, Ocracoke. They bought a struggling restaurant, The Pelican, on the main street in town, and called it Dajio, which stands for “Doug and Judy in Ocracoke.” They set out to turn it into a place for fresh, local food. But they brought one of their old recipes with them — sweet, jalapeño cornbread. They put it on every table before every meal. They are newcomers, and they help give Ocracoke its taste. The Eifers get almost all of their seafood from fishermen on the island. A man named Ferris brings the bluefish, flounder, and drum. Another man named Julian provides most of the shellfish. And a man named Rodney brings the clams. Rodney also helped Doug learn how to drive a boat. In June 2010, Ocracoke School graduated its senior class — four seniors, two girls and two boys. At Ocracoke School, the seniors and their families send personal invitations to people they want to attend graduation. One of the seniors in 2010 was named Aaron Caswell, who is now at Western Carolina University, in the mountains. Growing up in Ocracoke, Caswell learned to play music from Castro, the musician, at the school. He ate dinner and played concerts for the Eifers, the chefs, at Dajio. He is also the grandson of the first cousin of Jolliff, the lifelong resident, and a close friend of the family of Garrish, the real estate broker. He invited them all. Graduation was packed at the school that day. “There was no place to park your bike,” Judy Eifer says, laughing. Castro and Brenner, the Eifers, Jolliff, and Garrish all managed to find a place to park and sit. And when Caswell accepted his diploma that day, the people who help Ocracoke breathe stood and cheered for one of their own.